Polar Onyx is designed to operate in the IMR/construction/SURF market. The christening ceremony for the vessel was held in February 2014. Image courtesy of Ulstein Group. Polar Onyx was built at the Ulstein Verft shipyards in Norway. Image courtesy of Ulstein Group. The vessel’s first assignment will be for Petrobras offshore Brazil. Image courtesy of Ulstein Group. Bridge onboard the Polar Onyx offshore construction vessel. Image courtesy of Ulstein Group. The vessel has been chartered to Ceona on a five-year agreement. Image courtesy of Ulstein Group. RentOcean supplied the 2,000t carousel system and additional equipment to be installed on the vessel. Polar Onyx is an offshore construction vessel (OCV) built at the Ulstein Verft shipyards in Norway for GC Rieber Shipping, who ordered for the vessel in June 2012. The vessel was handed over to the owner in March 2013 following a naming ceremony in February 2013. Polar Onyx is designed to provide offshore installation or construction services for subsea umbilicals, risers and flowlines (SURF), and to perform inspection, maintenance and repair (IMR) works. It was chartered to British company Ceona Chartering (Ceona) under a five-year agreement with a scope to extend by five more years. 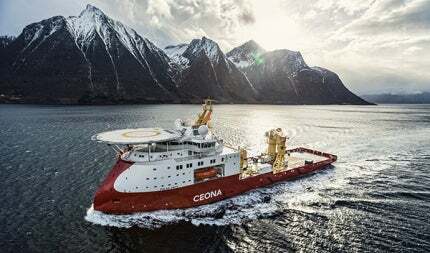 Ceona and Odebrecht Oil and Gas together entered into an agreement with Petrobras in January 2014 to offer submarine construction services using Polar Onyx as the pipe lay support vessel (PLSV) from May 2014 in Brazil. Polar Onyx features an advanced Ulstien X-bow design of type SX SX121. Its overall length is 130m, moulded breadth is 25m, depth to main deck is 10m and maximum draft is 7.6m, while the length between perpendiculars is 122.1m. The vessel’s deadweight is approximately 8,207t without vertical lay system (VLS) and 7,194t with VLS. The gross tonnage capacity of the vessel is 11,803t and the net tonnage capacity is 3,541t. The main deck of the vessel covers an area of approximately 1,700m² and has a loading capacity of 10t/m². The vessel has two moon pools with dampening chambers at all sides. The main moon pool measures 8m-long and 8m-wide, while the ROV moon pool measures 4.9m-long and 5m-wide. Polar Onyx received a number of DnV 1A1 class notations including SF, E0, DYNPOS-AUTRO, CLEAN DESIGN, NAUT-OSV(A), COMF-V(3), COMF-C(3), DK(+), HELIDK-SH, CRANE, SPS, VIBR and BIS to operate in severe weather conditions. The vessel comprises tanks for holding 2,078m³ of marine diesel oil (MDO), 1,086m³ of potable water, 6,300m³ of ballast water, 318m³ of Mono Ethylene glycol (MEG), 130m³ of urea and 156m³ of sewage. It is also equipped with a ballast water treatment plant and MEG glucol pump with a capacity of 100m³/h at nine bar. Navigation equipment onboard the vessel includes S-band and X-band ARPA (automatic radar plotting aid) radars, electronic chart display and information system (ECDIS), and radio. Internal communication systems include ULSTEIN COM® integrated communication system, battery-less telephone system, public address (PA) system, digital enhanced cordless telecommunications (DECT) forum and data network. Satellite TV service is provided in all offices and cabins. Polar Onyx is capable of accommodating 130 people. It has 12 state cabins with day-room and bedroom, 36 one-bed cabins and 41 two-bed cabins. The ship is designed with floating floor on five decks to limit noise and vibration levels. Facilities onboard the vessel include a hospital and sick bay, a mess with 75 seats, a 33-seat auditorium, conference rooms and offices, heli-reception, trim room, galley, dish-washing room, dry provisions room, two cooler rooms and two freezer rooms. Also present are an ROV workshop, deck pantry, separate wardrobes for male and female, laundry room and laundry handling room. The vessel features a helicopter deck, which can bear a maximum take-off weight of 12.8t and complies with DNV, UK-CAA: CAP-437, UKOOA and Norwegian CAA standards and regulations. The vessel also has an elevator with a capacity for 13 persons with eight stops and a maximum capacity of 1,000kg. Polar Onyx is equipped with a 12t knuckle boom deck crane with a maximum outreach of 16m at a dynamic factor of 3.4. A 250t offshore pedestal crane is also provided, with an active heave compensated (AHC) main winch on tank top providing access to depths up to 3,000m with a safe working load (SWL) of 20t at 36m outreach and 250t at 14m outreach. The crane also contains an auxiliary winch AHC with a capacity of 20t at maximum outreach of 40m. The vessel also contains two double windlass / mooring winches, two tugger winches with a pulling capacity of 14t and two aft mooring winches with a pulling capacity of 12t. The ship is outfitted with an IMO Class III DNV AUTRO dynamic positioning system (DPS), position reference systems including DPS700, DPS132 and RADius 1000D, and two HiPAP 501 type hydro acoustic reference units. Two separate independent operator stations on the bridge and an emergency operator station are provided for manoeuvring. ROVOP will provide hydraulic, work-class ROV services to Polar Onyx and Ceona Amazon vessels as part of a contract signed with Ceona in October 2013. "A 2,000t carousel system and additional equipment ordered from RentOcean will be installed once the ship starts operations in Brazil." Pipelay equipment aboard the Polar Onyx will be installed by Huisman. The roll-reduction system comprises three passive roll-reduction tanks, three heeling tank systems and three reversible propeller pumps. The vessel has ultraviolet (UV) sterilisers and a vacuum sewage treatment plant as per US Coast Guard (USCG) regulations. Two fresh water generators, each with a capacity of 15m³/day, and an osmosis freshwater plant, with a capacity to generate 25m³ of fresh water daily, are also fitted. A 2,000t carousel system and additional equipment ordered from RentOcean will be installed once the ship starts operations in Brazil. Safety equipment aboard the vessel comprises two enclosed lifeboats with davits capable of accommodating 80 people each, two life rafts capable of carrying around 25 people each and a man overboard (MOB) boat with one armed davit. Fire fighting facilities include a stand-alone fire-detection system, low-pressure water mist total flooding system for engine and switchboard rooms, and a local protection system. Polar Onyx is powered by a diesel electric power and propulsion plant equipped with six generator engines, each of 2,880kW. The propulsion system includes three main azimuth fixed pitch propeller (FPP) thrusters with nozzles, and two forward tunnel thrusters of controllable pitch and variable speed with a power of 2,140kW at 900rpm. With a controlled frequency converter, the three electric propulsion motors generate a maximum of 3,000ekW power each at 1,200rpm. An emergency generator of 300ekW is also provided. The propulsion system allows the vessel to cruise at a maximum speed of 15.1k.